LIMS system automates and streamlines laboratory workflow. Flexible login, online bench sheets, automated QC and reporting, and integration with online sample submission. Automate and streamline laboratory workflow to increase productivity. Element LIMS® system for laboratories that test water, soil, air, cannabis, and food. Element LIMS® system is a configurable Laboratory Information Management System (LIMS) that increases productivity for environmental labs that test air, soil, cannabis, water, wastewater, and food. Element LIMS system is used by environmental labs, water and wastewater treatment organizations, power companies, cannabis laboratories, and other analytical testing labs. A majority of these labs have reported an increase of 30 to 50 percent in productivity. Find out how Element LIMS software can increase your efficiency, strengthen quality, and expand access to information. Our singular focus on the needs of labs that test soil, water, air, food, and cannabis result in a LIMS that is “purpose-built” for the workflow of environmental, water/wastewater, and cannabis laboratories. Because of a design strategy to be configurable rather than customizable, we are able to produce a very flexible platform that is cost-effective to conform to your unique business policies. All LIMS software components are part of one system so you are not forced to purchase, integrate, or maintain additional modules for standard functionality. LIMS system features and functionality developed specifically for environmental laboratories that test soil, water, air, cannabis, and food (residue analysis). Streamline the project management process with project templates and an automated conversion of bids. Automated bench sheets, instrument integration, batch processing streamline sample management. Large library of EDDs (including support for CLP), automated report packaging, and strong analytical and operational reporting increase efficiency. Flexible login, granular tracking, and real-time alerts improve sample management. Optional EnviroChain EA eliminates paper CoC. Integrated QC, embedded calculations, and an extensive audit trail strengthen quality. Web portal that gives your clients quick and easy access to sample data, test results and documents, and integration with EnviroChain EA. Integration with online sample submission and chain of custody (CoC) application eliminates data entry and paper CoC. Configurable LIMS system for your specific business policies and procedures. An interactive and disciplined four-stage process refined over hundreds of implementations. Stable platform, reliable Microsoft technology, and recommended hardware and software requirements. Reduce IT costs by subscribing to the Element LIMS SaaS (software as a service) cloud-based offering. Explore additional information about Element LIMS including articles and white papers. "You can tell that Element LIMS was developed by people who understand the laboratory." Web-based sample submission and CoC application reduces cost, eliminates paper, and increases productivity. 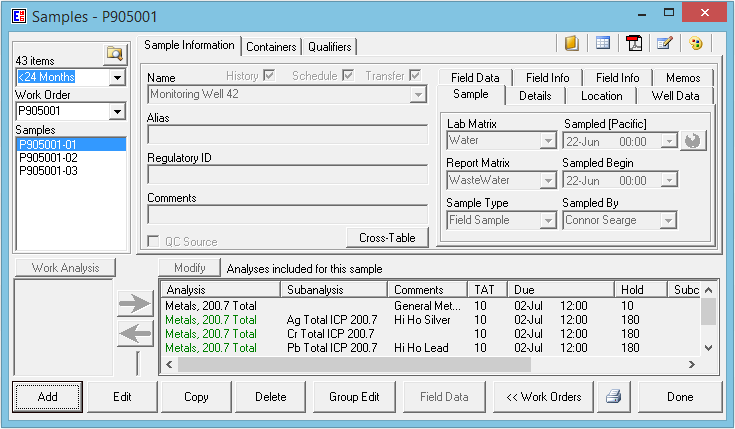 Give your clients access to final results data with an upload to DataConcourse for analysis, formatting, and reporting.